On February 8th, 2019, former Secretary of State Madeleine Albright came to Michigan Theater to discuss her 2017 book Fascism: A Warning, and discuss her tenure as Secretary of State. She shared the stage with University of Michigan History Professor Juan Cole, who along with the book company Nicola’s Books, promoted her book and discussed politics in the Trump era. Viktor Orban of Hungary and Vladimir Putin of Russia received special treatment: according to Albright their respective regimes embody the rise of “increasingly illiberal countries” around the world. This led into further discussion of Albright’s book, which stresses how many of today’s governments are beginning to adopt the ideas of fascism. When asked why she wrote the book, she explained her motivating philosophy: when you see something, it is not enough to just say something, you have to also “do something”. For her, writing Fascism was an opportunity to warn others about the alarming trends toward fascism around the world. 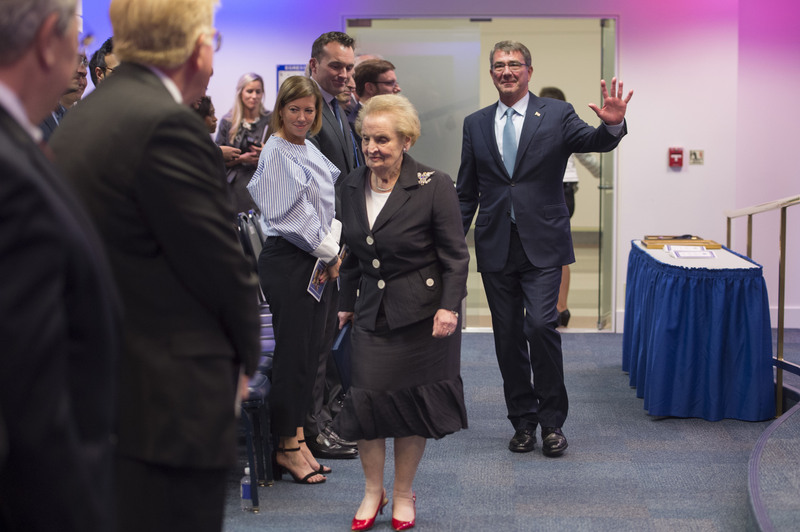 Viktor Orban of Hungary and Vladimir Putin of Russia received special treatment: according to Albright their respective regimes embody the rise of “increasingly illiberal countries” around the world. However, while she cautioned against labeling Poland and Hungary as fully fascist regimes, the only country she defined as truly fascist was North Korea. She said that negotiations with North Korea were better than the “fire and fury” initially proposed by the Trump administration. However, she characterized ongoing negotiations as a “Kim win” instead of a “win win,” since Donald Trump cancelled exercises with South Korea and other countries. She also argued that the absence of diplomats and the State Department from the process significantly limited its effects and made the relationship more dangerous. “Diplomats need to do diplomacy” rather than let Donald Trump take complete control of the process. She then turned to Q&A, in which she answered questions about the the Iran Nuclear Deal, her television career, and conservatives on campus. Addressing the Iran Nuclear Deal (JCPOA), she felt withdrawal was a bad decision in that it “undermined” our position in world affairs: by withdrawing from the deal itself we undermine our ability to do diplomacy elsewhere. She also answered a question regarding ideological diversity on campus. She stated, “It is important to talk to people you disagree with,” and recounted her experience with those across the aisle. The audience was very receptive to her and she seemed like she hadn’t lost a beat, quickly jumping from serious political point to a funny story from her past. As a former Secretary of State, she is someone we must take seriously, as she is the one of the most nuanced people left on the more “liberal” side of the spectrum.